Leslie Model 130 | MOSweb Online! 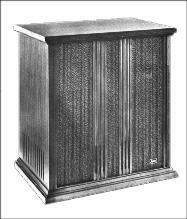 Single channel, single rotor cabinet with internal amplification. This cabinet is somewhat odd in that in addition to it’s 12″ rotor speaker there is also a stationary tweeter on the rotary channel. According to the manual, the 12″ speaker handles frequencies below 400 hz and the tweeter handles frequencies above 4000hz – leading to the conclusion that between 400 and 4000 hz there is a gradual transition between the two. The crossover could be bypassed however making this essentially the same as a 125 cabinet, but with solid state amplification.